NASA administrator Jim Bridenstine plans to request more money from Congress in order to meet the Trump administration's new deadline of landing astronauts on the moon by 2024, he told the House Science, Space and Technology Committee on Tuesday. Why it matters: NASA will need more funding if it plans to achieve President Trump's new goal of sending astronauts to the moon in the next five years — four years earlier than planned. NASA also intends to use this moon mission as a stepping stone to send people to Mars, but first the agency needs to complete its most powerful rocket yet as well as a crew capsule known as Orion. By the numbers: Bridenstine isn't quite sure how much more money the agency will need for the accelerated plan. The administration's budget request for NASA, submitted to Congress in March, requested $21 billion for the space and aeronautics agency, but didn't include funding for the 2024 mission other than about $300 million for the development of a new lunar lander. That budget request represented a 2% cut for the agency when compared to fiscal year 2019 funding levels, though lunar programs would not be cut. The budget also targeted a 2028 lunar landing. What they're saying: "What we’re working on right now at NASA is compiling the data necessary to come back to this committee — to come back to Congress — and ask for an amendment to our budget request and attempt to win the buy-in of this critically important committee and the United States Congress," Bridenstine said, adding that he hopes to deliver the amended budget request by April 15. "And what is the justification for this crash program? To quote the Vice President ... it's because 'we're in a space race today, just as we were in the 1960s, and the stakes are even higher'. Moreover, according to the Vice President, the Chinese have 'revealed their ambition to seize the lunar strategic high ground', whatever that means. The simple truth is that we are not in a space race to get to the Moon. We won that race a half-century ago, as this year's commemoration of Apollo 11 makes clear. " Between the lines: One fear of some in Congress and at NASA is that the Trump administration will cannibalize other NASA programs in order to direct more funding toward the moon, rather than by boosting NASA's overall funding. 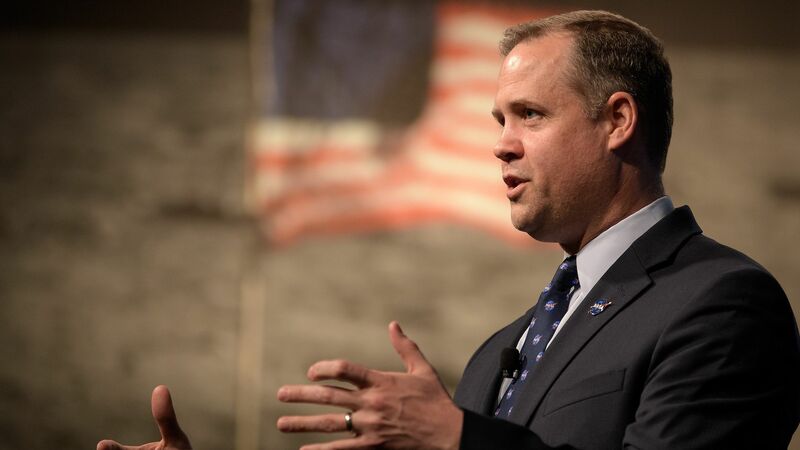 However, Bridenstine made clear that would not happen, saying the mission would not succeed if NASA is forced to cut other programs. Reality check: Moving the goalposts for NASA and this mission to the moon is just another example of whiplash when it comes to the agency's flagship programs. Under the Bush administration, NASA was aiming for a return to the moon only to be directed to an asteroid under the Obama administration. Now the agency is again heading back to the moon. Changing the timing of moon landing will force NASA's contractors to move up their own timelines, leading to concerns about the feasibility of the program.